The Breed originated in the United Kingdom. 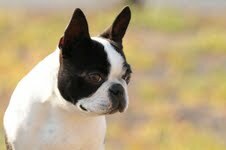 The first Boston Type dog was the result of a cross between a bulldog and an English white Terrier. 4. 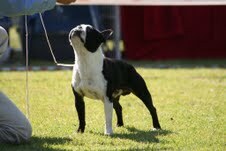 Which other breeds are most compatible with the Boston Terrier? 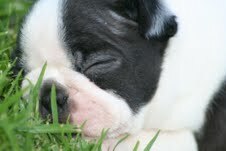 Like any breed Boston’s must be socialized properly from a young age. If you have a large male dogs you can let you’re female Boston run with him, or vice versa, but please make sure that the female is not in season when you do so. unless you are involved in showing or a professional, registered breeder, we do recommend that the dogs are sterilized whether male or female – this is being a responsible owner. Big female dogs and other female’s dogs don’t like each other, please try to avoid this. If you do decide to take a Boston, they are more compatible with smaller dogs. Yes, they enjoy the company. When you do decide to do that buy the first puppy first so that the puppy bond with you as the owner, and then wait about 6 months – 1 year to purchase your other Boston. When you get your puppy from the breeder at 8 weeks the Breeder should provide you with a good training school to take your puppy too. All dogs need puppy training; this is the most important training they NEED TO HAVE!! Bostons are easily trained, but the secret is to make sure both of you are having fun; it shouldn’t be an effort… Also make sure that the dog doesn’t train you, but you train him/her. You are the owner not the dog. The Boston should be routinely screened for eye problems, patellar luxation and deafness. 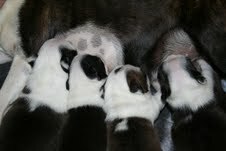 A responsible breeder would use a specialised vet for this purpose, not just their local practice. You can also ask if you can see if the parents are screened. You’re Boston would live up to +- 10 years if you as the owner look after you dog and feed him/her good quality food. 9. Do’s and don’ts of this breed. Don’t leave your dog without food, water and lots of love. This is for all breeds not just the Boston. When it’s cold keep your Boston warm, and when it’s warm keep him cool. Don’t do any jumping “agility” before the age of 18 months.